As leader of the Oxford penicillin project, Howard Florey achieved international recognition, both among scientists and the wider public. He became president of the Royal Society, Britain’s national scientific academy, in 1958 and was made Lord Florey in 1965. Like other notable scientists, his memory has been preserved not only through his scientific work but through personal relics. The possessions displayed here were given to the Museum by his second wife, Margaret Jennings, who was his research assistant. 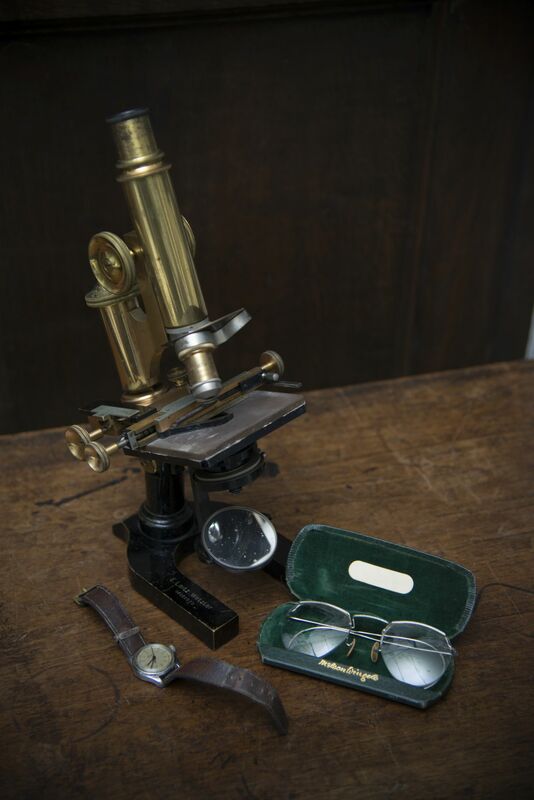 The microscope was made by E. Leitz in Wetzlar, Germany c.1920 (inv. 29752). The wristwatch and spectacles are items of everyday wear (inv. 33678 and 23350). Also in the exhibition is a second pair of spectacles, which is for specialist use when conducting operations (inv. 23114).